R Baker (Electrical) Ltd aims to provide full turnkey transformer rewinds solutions. 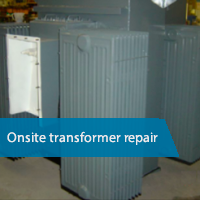 We have over 34 years of experience in rewinding and repairing transformers. Not only can we rewind transformers, we can also reverse engineer damaged transformers. This means we can manufacture new transformers which are past being rewound. We can also work from drawings and winding specifications if required. This saves time and ensures your product is obsolescence proof. Our transformer team is one of the leading technical teams in the UK when is comes to transformer rewinds. Our transformer rewind service is available 7 days a week on request. This provides peace of mind should you have a transformer breakdown. We understand how important it is to get your equipment back up and running as quickly as possible. As you cannot predict when a transformer will break down, it is vital that you can talk to someone with the technical knowledge to be able to assist you. Our technical team can offer advice over the phone or attend your site to assist with any breakdowns. No matter which industry you work in, we will be able to help you. We have experience in the defence, marine, rail and offshore sectors. We are able to rewind transformers to the standards required in your industry sector. Having a transformer rewound to the original specification is a critical part of any transformer rewind. We can guarantee this by, recording all techincal data throughout the disassembling process. Using the same standards as our manufacturing process we ensure the reassembly of every transformer is to the highest of standards. We also run planned transformer maintenance programs with a wide range of national businesses. We can start a transformer maintenance program from scratch or using existing data to provide ongoing support. We aim to provide full turnkey solutions, driven by our electrical manufacturing and repair team. We specialise in the installing, overhauling, cleaning and repairing of transformers up to 500kVA. R Baker (Electrical) Ltd is based in Liverpool and is perfectly positioned to service the whole of the UK. We provide an effective, quality assured transformer rewind and repair service. If you need to discuss your transformer maintenance with one of our team please call 0151 486 6760. Over time, transformers will develop crucial problems. This can be prevented by regular transformer oil sampling and general inspection. Our transformer team carry out documented oil sampling and transformer inspections. This reduces the need for downtime when a transformer fails which may result in a total rewind. To extend the life of your assets it is important to put in place a preventive maintenance schedule. Transformers degrade over time and finally they lose the capability to withstand the stresses put on them. With regular inspections the risk of failure can be hugely reduced.